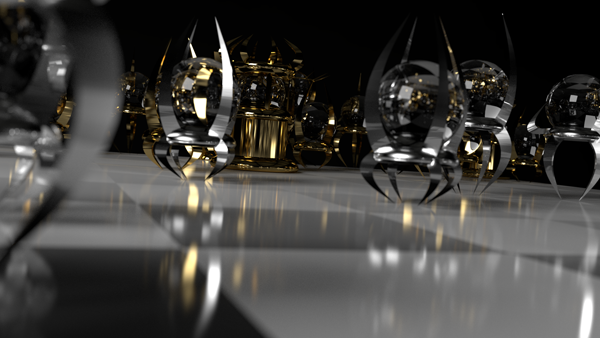 The tools of the trade #2 – Blender was posted on June 2nd, 2014 at 4.06pm and is filed under 3D, Tools. This entry has no comments (yet). You can follow any responses through the RSS 2.0 Feed. Blender. Do we still have to present this tool? Yeah? Ok. Blender is a free and Open source 3D graphics and animation software. For newbies, that means it allows us to create objects and characters you’ll later find in our games. Moreover, it is multiplatfom! Cherry on top: it is coded in Python. Knowing this, those who know us won’t be surprise that we use this software. Only dark spot: the interface. Until Blender 2.5, the user interface was ascetic. You had to know the key shortcuts quite well to create anything. This problem was thankfully solved in the latest versions. And keyboard freaks may rest assured: they shortcuts still works, they are just less necessary. Of course, for the games, this requires a bit too much performance. We usually use the basic 3D motor. As those who follow the blog already know, three years ago, Christel, Batien and Thomas followed a 3D training in the near Institut de formation supérieure. Interesting fact: the cursus was planned to be give in 3D Studio Max, another development software. However, we pressed the teacher to give us the lesson on Blender in parallel with the other students. It worked so well that now, the lesson is actually given in Blender! We don’t feel sorry at all. We followed this training two years in a row, dragging ourselves to the class on Saturday morning at the crack of dawn to learn 3D modelling and Blender. Bastien even went back for a 3rd year (and dragged Joan along, yeah, remember, she participated with us to Ludum Dare 24). Christel, 3D graduation work, second year, theme “reproduce an image” – Does it ring a bell? Something specific about 3D modelling is that it’s another world. Anyone who ever opened a 3D software to “see how it looks” did notice: start from scratch, without training nor tutorial, is pretty hard. Thinking in vertex, side, face and node, or understand what is a normal require some time. 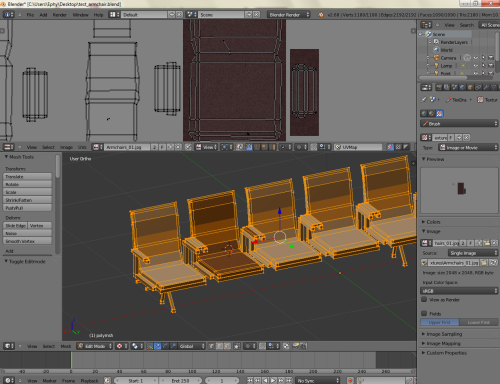 But once this step is done, Blender becomes accessible, thank to its new interface and its possibilities. An example? The transformers, which allows to calculate automatically a serie of aligned object thank to the array, or to work symmetrically with the mirror. Moreover, and it’s a major asset, Blender interfaces perfectly with Unity 3D (see our previous post). Translation: Unity3D interprets easily the native Blender format (the .blend files). We just have to add our models’ files in our project for them to be accessible. Seriously, we just have to drag & drop the objects for them to appear. It’s like magic! Well, all our 3D ones! 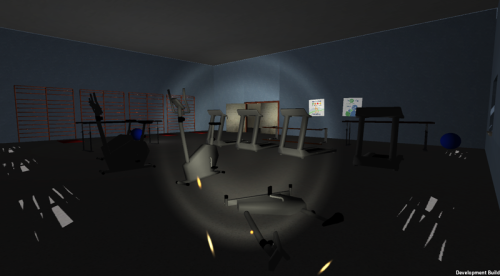 GSM Productions’ first serious try or a 3D game… during a Ludum Dare, of course! The Ludum Dare 20. The graphisms were mainly basic cubes and cylinders, but still. 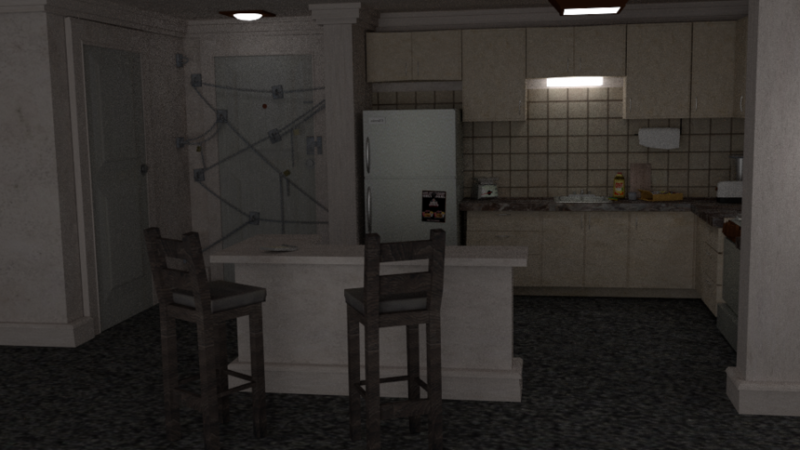 The several objects from the game were modelized and textured in Blender, in an old, infernal-like interface version. A Python plugin written by a community member exported them to one of the formats used by Panda3D (that we used before starting to work with Unity3D). Not only level 3 was entirely modelized in Blender, but we established the colliders and placed the monsters and all elements of the game in Blender before exporting to Panda3D. Considering it was a platformer in which 3 level out of 5 were in 2D, it was not our most intelligent choice (but we’ve been working on that). The characters were modelized in Maya by a friend designer who helped us in that adventure: Jonas. Of course we were going to talk about our little baby. The full Ludum dare version was modelized by Christel in Blender (she was telling you she’d gotten better…). The animation as well had been done on Blender, by Bastien. In the following versions (that you still can find on FrenchCows), the majority of the objects is still done on Blender. Dimitri, who helped us a LOT especially with the characters, uses his own tools. In conclusion, Blender is a powerful, reachable tool on a technical point of view, free, Open source and multiplatform. What else?